Confederate Cemeteries, Volume 1 – Over 200,000 Confederate soldiers died during the Civil War, but no one has ever compiled a listing of their names. The Confederate Cemeteries series fills that void. Using heretofore unpublished cemetery rosters, long out-of-print books, unpublished manuscripts, 19th century magazine articles, and cemetery surveys; Mark Hughes has compiled the names of over 9,500 soldiers and civilians buried in 30 cemeteries in Virginia. 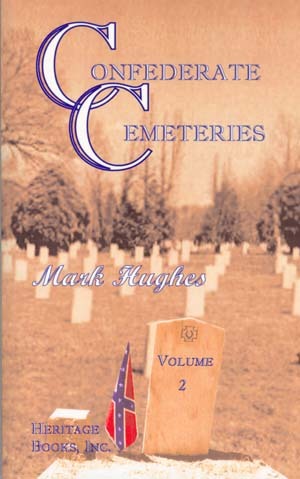 In writing Confederate Cemeteries, Mr. Hughes used material from state archives, The Library of Congress, The National Archives, university library collections, and material located in private collections. Arranged alphabetically, the information about each soldier, in most cases, includes, the solder’s name, company, regiment, state, and date of death or burial. Occasionally the cause of the solder’s death is included. The vast majority of the burials listed are Confederate soldiers that died during the war. However, also included are the names of some 20 civilians who also died as a result of the war as well as the names of some 100 Union soldiers that were buried along with the Confederates. The deaths of these Union soldiers were not included in the United States Quartermaster’s 27 volume Roll of Honor series. The majority of these Federal solders’ remains were never moved to national cemeteries. Cemeteries in volume 1 include Richmond’s Shockoe and Hollywood, Holston Conference at Emory and Henry College, Prospect Hill at Front Royal and Woodstock’s Massanutten. In addition to burial rosters this book includes a brief history of each cemetery along with an overview of the struggle faced by Southern Women to bury the solders of the “Lost Cause.” Many photos highlight this must have for those researching the Civil War. (2002), paper, index, 436 pp. Autographed copies of Confederate Cemeteries, Volume 1 are available from the author for $35.50 plus $3.50 for shipping and handling. The second book in the Confederate Cemeteries series, Confederate Cemeteries, volume 2 lists the names of over 10,500 Confederate soldiers that died during the Civil War. The vast majority of the burials listed are Confederate soldiers that died during the war. However, the names of some Confederate veterans are included. Also included are the names of over one hundred Union soldiers that were buried along with the Confederates. The deaths of these Union soldiers were not included in the United States Quartermaster’s 27 volume Roll of Honor series. The majority of these Federal solders’ remains were never moved to national cemeteries. Also included are the names of servants, slaves, and even one African-American Confederate buried in these cemeteries. In writing Confederate Cemeteries, Mr. Hughes used material from state archives, The Library of Congress, The National Archives, university library collections, and material located in private collections. Some of this material included heretofore unpublished cemetery rosters, long out-of-print books, unpublished manuscripts, 19th century magazine articles, and cemetery surveys. Arranged alphabetically, the information about each soldier, in most cases, includes: the solder’s name, company, regiment, state, and date of dead or burial. Occasionally the cause of the solder’s death is included.